Help me use global variables because apparently I can't make it work. If its not clear from the thread. The solution is that global must be specified at the start of each function to give it access to those variables. Here is my script. It has two messageboxes that confirm the "global" variable is not working in my 2nd function, but the local one is. The second messagebox shows that the 3rd function cannot reach the "global" or 2nd function variables. 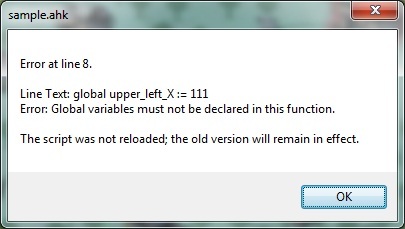 When I add a global next to each variable at the top I get this error, which seems to be telling me I am not declaring these correctly. I'm trying both of these when I get a chance. So far I think AHK_L is throwing a wrench into my errorlevel if statement, but I can access the variables inside the function. I had the idea to pass all the things I needed globally using arguments, but didn't because I may need to change them on the global level from inside the function. Maybe ByRef will let me do that if it is like a pointer to memory or something. Reading the documentation over a few times I think I figured it out. I was only declaring the variable and value in SetDefaults(), It needed to be "declared" in the target function as well. Msgbox, global lower_right_Y is %global lower_right_Y%	  ; returns 974 correctly. That's great how you figured that out. Here is another way that involves both functions. MsgBox, Function 1 `nglobal upper_left_Y is %upper_left_Y% ; returns 120 correctly. Msgbox, Function 2 `nglobal lower_right_Y is %lower_right_Y% ; returns 974 correctly. This cuts the code needed in half and keeps the variables in one place. I think you said earlier you were just wanting to figure out global variables so, again, I'm just suggesting this way also. Hope you find what your looking for. EDIT: I just read TLM's post and I agree. This post is what it would like with code. Hey I appreciate that. I'm going a little crazy as I add more features and having to juggle even more variables across different functions. I'm going to try this today. I also noticed that AHK_L seems to be the default download but I don't know when that occurred. Figured this out a long time ago but just cleaning up the thread in case someone from google stumbles in. I really don't like declaring gobals outside of a function because it has to be at the very top of the .ahk. Maybe this can be solved with a #include globals.ahk but actually my favorite solution is to use a modified version of Superfraggle's Auto read,load and save an .ini that lets you specify an ini and converts everything in there to global variables. To answer my original question, each function just needs to specify the word global at the beginning and it will have access to all global variables, it doesn't need them written again. Here global is at the top so any global variable can be accessed, and a variable "ValueLine" is added to the pool of globals. Keep in mind that overuse of globals can have drawbacks, but the vast majority of ahk uses should not run into any of these issues.